Un Clocheton | One quality, the finest. 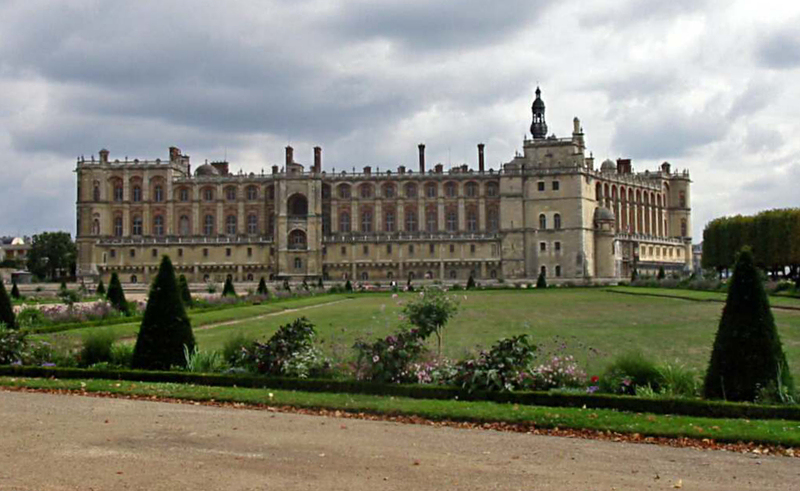 The Château de Saint-Germain-en-Laye has had a l-o-n-g history, so it’s no wonder that it’s currently getting a facelift. The oldest parts date to the 12th century and in the 20th century, it housed the German Army headquarters, so it’s understandable that it might need a little work. Today the Château, located about 15 miles west of Paris, is the home of the Musée d’Archéologie Nationale (National Museum of Archaeology). The last time that significant work was done on the Renaissance-style Château was 1875. The estimated cost of this go-round is 15 million Euros. First up for repairs on this huge structure was a little bell tower, or clocheton, that has housed the bells that have announced the hour since 1683. The oak beams of the roof are protected by a thick, lead layer that makes it watertight. The bells of the tower are in need of a little spa treatment as well. Two of the bells date to the reign of Louis XIV and the third is a relative newcomer installed during the empire of Napoléon III. The largest bell, the bourdon, weighs about 1.6 tons, so getting it in and out of the spa is no easy feat. 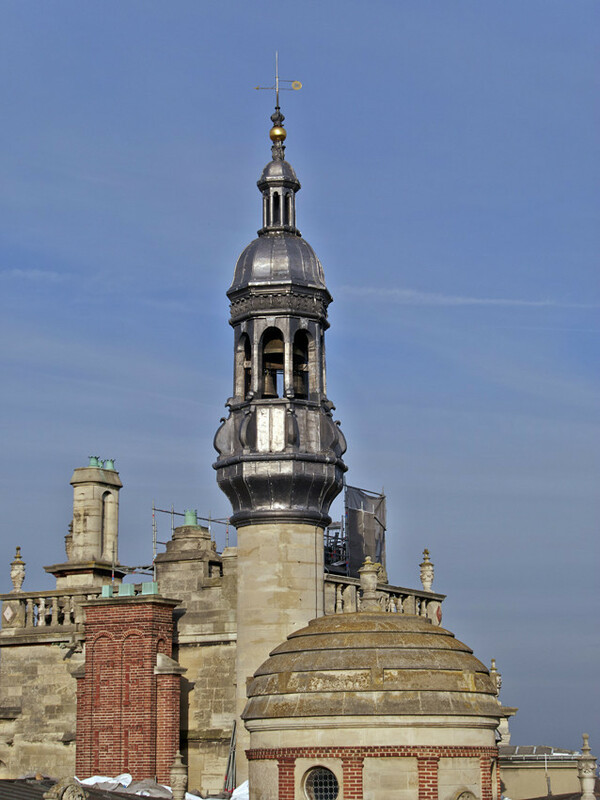 The final touch in the restoration of the tower is just decorative, unlike the hard-working bells. 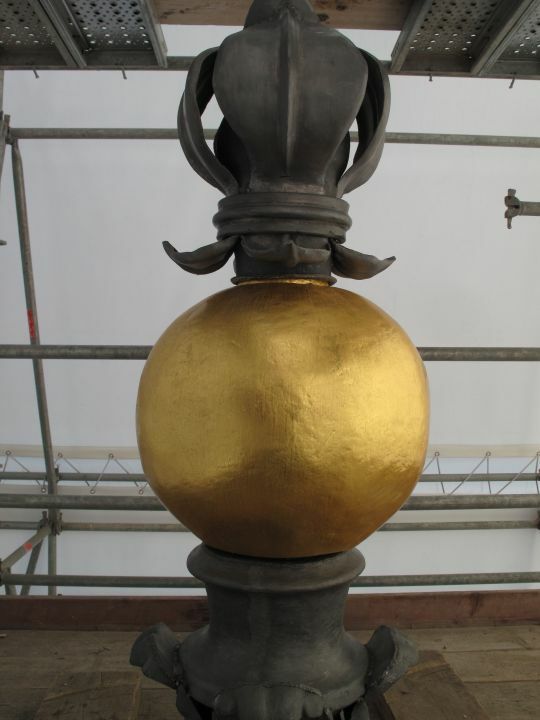 The spire is accented by a 132-pound ball covered with a layer of 24-carat gold leaf. The clocheton is ready for another 900 years or so. Patricia Gilbert is a French teacher. She's Canadian, lives in the United States, but dreams of living in France. Follow her on Instagram @Onequalitythefinest and on Twitter @1qualthefinest. This entry was posted in Architecture, Jewelry and tagged Château de Saint-Germain-en-Laye, Conservation-restoration, French chateau, Musée d'Archéologie Nationale, un bourdon. Bookmark the permalink.